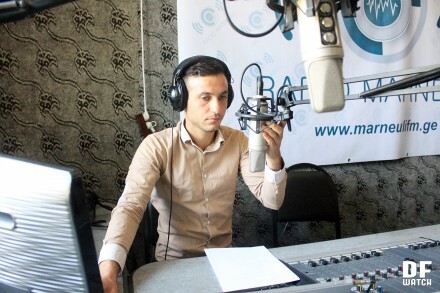 TBILISI, DFWatch–In Marneuli, a predominantly ethnic Azerbaijani town in the south of Georgia, the community radio is the only media outlet which is critical of the local government and trying to be balanced, unbiased and objective. The people behind Radio Marneuli went through many difficulties until they finally got a license and went on air. We visited them to speak about their challenges. Kamila Mamedova told us that the idea to have a community radio in Marneuli originated with the BBC in 2006. They announced a competition and recruited 16 people, who were given training. Then they bought equipment. But the National Communication Commission refused to give them a license for FM radio broadcasting. “They were afraid of the ‘free microphone’, but of course different reasons were written on the paper,” Mamedova recalls. She says most people had no Internet connection then, so they didn’t know how to reach people. They tried distributing their broadcasts by handing out audio cassettes among locals. “We even installed loudspeakers in parks. Youth were interested. The quality was bad, but it was live. But we couldn’t carry on this way forever,” Kamila says, adding that the financing lasted two years and then they gave up. After a nine year break, Radio Marneuli finally got a license one month ago. Now Kamila has found new staff and organized the office with the equipment they had kept in storage which was purchased by the BBC. The tiny room is bustling with activity and contains about ten computer desks. In addition, there is one studio. Most of the staff are young ethnic Georgians and Azerbaijanis. Half of them are employed, while the rest are volunteers. The radio station is still only available on the Internet, but a schedule is being prepared that will fill 12 hours a day. Once on the airwaves, it may be received in the town Marneuli and a few surrounding villages. Naniko Sisvadze said one of the challenges she and other journalists at Radio Marneuli are facing is that the local municipality is not used to being asked questions, especially critical ones. Radio Marneuli now has shows both in Georgian and Azerbaijani language. There are hosts who have their own shows. Parvin Abdulaev for instance, has a show about traditions. He speaks with his guests about traditions for weddings and funerals and similar topics. Another show, hosted by Ainura, is about travel with guests sharing their travel experiences. Some of the most popular everyday topics they have reported have been about ownership of land, how land can be registered, drainage and water irrigation issues. Kamila says they currently don’t have a right to air commercials, but they hope to get this by the time they start broadcasting on FM. “Everything is new for us now. We hope we will be able to support ourselves financially in the future, at least on a minimal level,” she says. 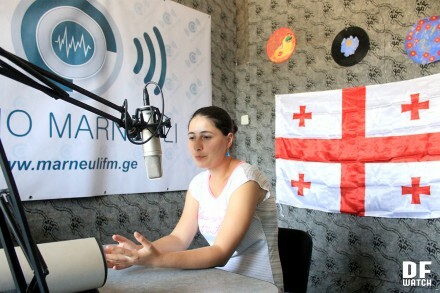 She hopes that Radio Marneuli will be available on FM by the end of the year.